>> today german health officials say they have not found the source of a super toxic new strain of e. coli that's now killed at least 17 people and sickened more than 1,500 including some american tourists. michelle kosinski is in hamburg, germany, with the latest on the story. good morning. >> reporter: hi, ann. it's a new mutant, highly toxic and highly resistant. it causes kidney failure and doctors say in two-thirds of serious cases they are seeing severe neurological symptoms with everything from difficulty speaking to seizures and paralysis. this is the epicenter of an outbreak that is disturbing scientists. they don't understand why it's causing such sickness or where it came from. they do know it attacks the kidneys and the brain. of the 102 victims in this hospital, some children, some pregnant women , a third have suffered kidney failure , a fifth are in intensive care. doctors found they all seem to have eaten raw cucumbers, tomatoes or lettuce, maybe all of the above. >> we interpret this -- my family interprets this as not eating any raw vegetables, period. >> reporter: at the epicenter many restaurants have stopped serving raw vegetables. >> reporter: yet in one of the busiest spots in hamburg there were cucumbers, tomatoes and lettuce in the buffet and plenty of people devouring them, not worried. but all of the doctors say if you're in this region, don't do it. there are too many people who may have eaten those healthiest foods and now hang on to life. even three weeks after this started it seems like every single one of the more than 1,500 cases in europe and beyond is still linked to northern germany . scientists aren't talking about a big risk of this breaking out some place else, at least not for now. 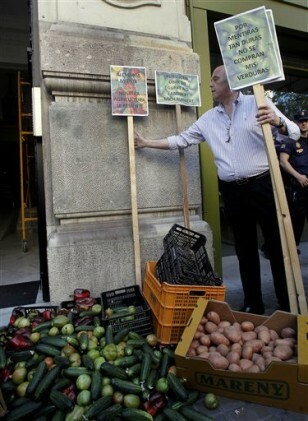 A farmer in Spain places a sign reading "Because of such big lies, nobody is buying my vegetables" as protesting farmers dump some 700 pounds of fruit and vegetables, cabbage, tomatoes, peppers, cucumbers and other produce outside the German consulate in Valencia, Spain on June 2, 2011. Spain says it is not ruling out taking legal action against German authorities for blaming Spanish vegetables for the E.coli outbreak that has killed 16 people.